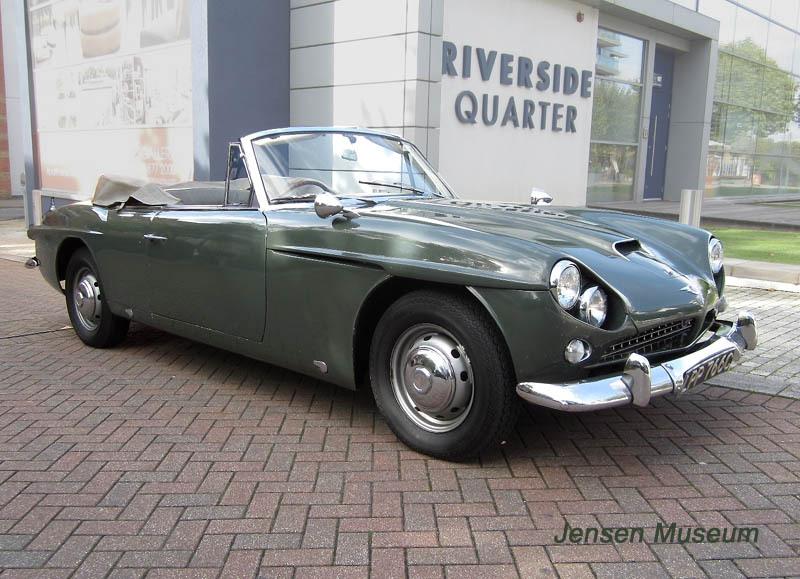 When you feel your years of Jensen CV8 custodianship have come to an end, why not let THE JENSEN MUSEUM sell your car. Built in 1964, this particularly original car was once owned by the actor, Sean Connery. In fact, Connery purchased the car just as he had finished the James Bond movie, You Only Live Twice. Remaining today on its original factory colour scheme of green paint with beige trim, the car has a full history line from 1964 to date. Even the old green logbook remains within the history file, showing Sean Connery as the second owner, and bearing his signature. This CV8 was acquired for the Jensen Museum collection in 2014. Various sympathetic refurbishment work has been undertaken while the car has been in our care, especially in regard to the interior, which has been beautifully restored back to its former glory. A unique chance to add the most famous Jensen CV8 to your collection. Built in 1965, this important and unique car remains with its original smoke green paint, and with its original leather trim. Supplied to the London-based distributors, Charles Follett, the car was quickly purchased by the then foreign Secretary, Lord Carrington. Since Lord Carrington disposed of the car in 1967, it has been within one family until offered for sale today. The car is particularly original, and provides an opportunity for the buyer to acquire an important part of Jensen heritage. The Jensen C-V8 is a four-seater GT car produced by Jensen Motors between 1962 and 1966. Launched in October 1962, the C-V8 series had fibreglass bodywork with aluminium door skins, as did the preceding 541 series. All C-V8s used big-block engines sourced from Chrysler; first the 361 and then, from 1964, the 330 bhp (246 kW) 383 in³. Most of the cars had three-speed Chrysler Torqueflite automatic transmission, but seven MK.II C-V8s were produced with the 6-litre engine and four-speed manual gearbox , followed by two manual Mk3s. While the great majority of C-V8s were made in right-hand drive (RHD), ten were made in left-hand drive (LHD). The car was one of the fastest production four-seaters of its era. The MK II, capable of 136 mph (219 km/h), ran a quarter mile (~400 m) in 14.6 seconds, and accelerated from 0–60 mph (97 km/h) in 6.7 seconds. Upgraded, the new MK II, introduced in October 1963, had Selectaride rear dampers and minor styling changes. Changes on the MK III, the final version of the series which was introduced in June 1965, included a minor reduction in overall length, deeper windscreen, equal size headlamps without chrome bezels, improved interior ventilation, wood-veneer dashboard, the addition of overriders to the bumpers, and a dual-circuit braking system. From concept, the front of the C-V8 was styled with covered headlamps, similar to those on the Ferrari 275 GTB and Jaguar 3.8 E-type as a key element of the design. But, because of concerns that they might reduce the effectiveness of the headlamps, the covers were deleted for the production cars. As a consequence the C-V8’s front-end appearance was compromised and proved controversial for decades. The CV8 model was discontinued in 1966 after a total production run of 500.